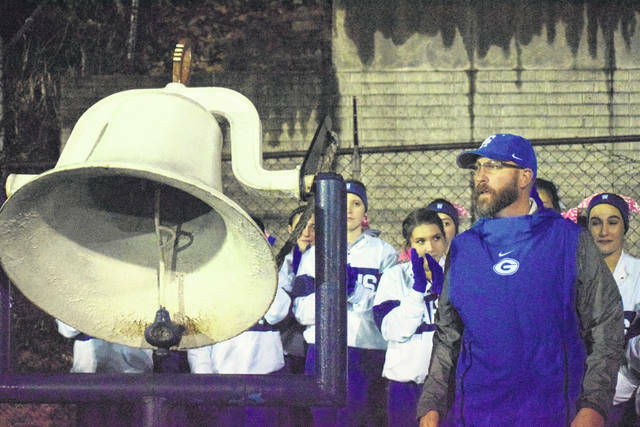 Second-year GAHS football coach Alex Penrod talks to the home crowd by the victory bell after the Blue Devils defeated South Point in Week 10 for the program’s first-ever OVC championship at Memorial Field in Gallipolis, Ohio. COLUMBUS, Ohio — Another first in a season full of them. Second-year frontman Alex Penrod became the first Gallia Academy football coach to win state honors after being named the Division IV coach of the year for 2018 by the Ohio Prep Sports Writers Association during the annual release of the All-Ohio teams in the Buckeye State. Penrod — who guided the Blue Devils (9-2, 7-0) to their first-ever Ohio Valley Conference championship in an outright fashion — ended six years of gridiron frustration this fall after getting GAHS to its first winning season, first league title and first playoff berth since the 2012 campaign. Penrod was the lone recipient of the Division IV coach of the year honors and was also one of seven Blue Devils to appear on the all-state squad. Overall, the Ohio Valley Publishing area landed 15 people on the all-state teams within their respective divisions. All six Ohio-based schools had at least one representative on the teams. All but two of the 14 local players received special mention honors in their respective divisions. A pair of GAHS seniors — Jacob Campbell and Justin McClelland — came away with higher accolades at the D-4 state level. Campbell was named to the first team as a linebacker, while McClelland was a second team choice at quarterback. Campbell — the OPSWA Division IV Southeast District and OVP Super 25 defensive player of the year — accumulated 82 tackles, 15 tackles for loss and two forced fumbles. Senior Lane Pullins, junior Cade Roberts, and sophomores James Armstrong and Riley Starnes were also special mention selections on behalf of the Blue Devils in Division IV. Meigs (4-6) had two players named special mention in Division IV in seniors Zach Bartrum and Cole Adams. Senior Ty VanSickle represented River Valley (1-9) as a special mention selection in Division V.
Eastern (5-5) and Southern (6-4) both came away with two special mention choices on the Division VII squad, while South Gallia (3-7) also had a single representative on the D-7 team. Senior Blaise Facemyer and sophomore Blake Newland were chosen on behalf of the Eagles, while senior Logan Drummer and junior Trey McNickle were the Tornado duo named to the squad. Junior Kyle Northup was the lone choice on behalf of the Rebels.